Many of our modern day saddles have been fashioned with the historic military saddles in mind, as the saddlery used by the mounted forces was proven time and time again to be exceedingly compatible for strenuous long distance riding. Thus the superior comfort and security over interchangeable terrain of the McClellan Saddle has been incorporated on many horseback safaris and treks around the world to ensure a pleasurable holiday experience. The McClellan Military Saddle, known throughout history in both myth and fact, was first designed for military use by George B. McClellan of the US Army, after touring Europe and witnessing battles of the Crimean War. Collecting working knowledge of the European models and their cavalry regulations, he brought back hundreds of books and manuals to study. Assigned to the task of developing new cavalry equipment, he eventually produced the first design for his now infamous saddle in 1857 which he claimed to be a revised version of the Hungarian models used in the Prussian Services. This fact was and still is, occasionally questioned, as the saddle McClellan created had a distinctly Spanish-type saddle tree resembling that which was found extensively in Mexico during this era, as well as various regions the United States. After a few adjustments, it was promoted as the official military saddle for the US in 1859 due to its simplistic, light-weight design which was easy on the cavalry horses, while at the same time it was sturdy enough for rider support and additional gear. It had a rawhide open seat with a thick leather skirt, complete with wool girth and stirrups made of wood. 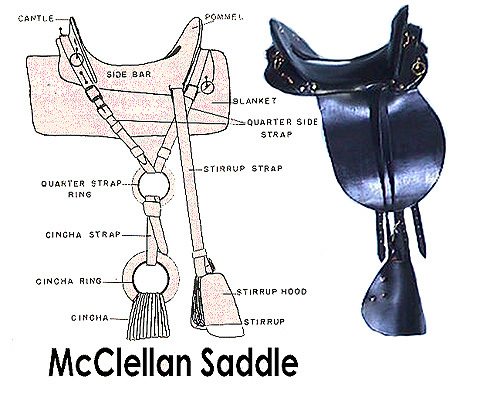 The McClellan Saddle went on to reign as the exclusive American cavalry saddle until the last mounted military force was disbanded in World War II and afterwards it was kept in use as ceremonial saddles for the military. The McClellan Saddle also found homes in countries like Mexico and Rhodesia and even to a limited degree, it was utilized by the British in the Boer War. The Mexicans created their own version of McClellan for their military service while Rhodesia used the saddle for their Grey's Scouts, a mounted infantry unit in action from 1975 to 1980. South Africa received unspecified quantities of the McClellan to use for their mounted game wardens during the 80's and Canada also received a few for test purposes for their own mounted police. The McClellan has had continued use even today, but has since been repeatedly remodeled, although it retains a very close resemblance to the original. 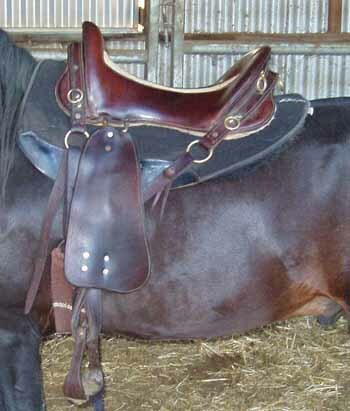 It is presently used largely for endurance riding, but now it is often a pleasure saddle as well and commonly also sought after by historical re-enactors. Hidden Trails utilizes McClellan Saddlery on various trips of ours. Some of our partners employ them overall, while others have the McClellan simply as a choice among the rest of their saddlery selections. It is a favorite pick for riders on our Colonial Hacienda and Inca Trail and our Cotopaxi Adventure Ride in Ecuador as well as being incorporated as the sole preferred saddle style for our Cappadocia Ride in Turkey. Our Costa Rican partner offering The Old Spanish Trail and Ranches, Volcanoes and Beaches Ride uses a Costa Rican revision of the McClellan among her saddle selections and our partner in Bulgaria with the Land of the Thracians Ride uses primarily another type of saddle, but they boast one original McClellan from 1895 which they have lovingly refurbished for modern use!